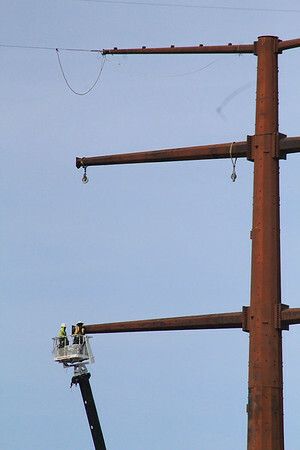 Two workersr with PAR Electrical Contractors Inc. of Kansas City, Missouri, work in a bucket at the top of a crane to install equipment on a new electric transmission tower at C.R. 29 and U.S. 6 Monday. The tower is one of many that make up the new100-mile NIPSCO transmission line from Reynolds and Burr Oak to Topeka. The project is expected to be completed late this year, according to NIPSCO's website.